Not that surprising though... it is only a mere 3128km between Malé and Kuala Lumpur but there is a three-hour time difference! Malaysia is probably already 9am. . . No wonder the sky was so bright. . . 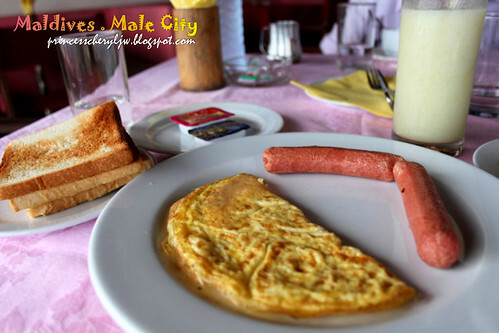 I really wanted to stay in bed, but we need to get up and be prepared to meet up with our local Maldivian friend, he's going to walk us around Malé city. The alley beside our hotel. Darn artistic. 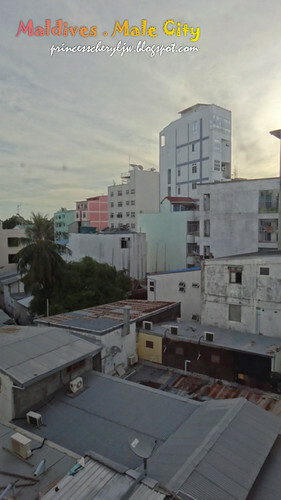 Basically Malé is a concrete jungle, I could hardly find a tree. 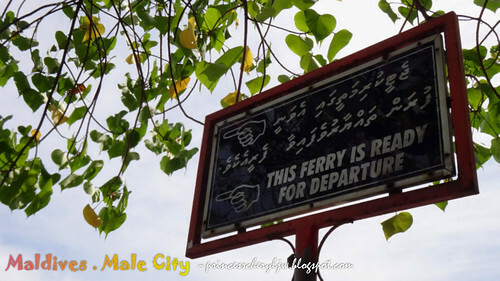 It was quite late when we landed last night, so I missed the bird's eye view on Malé. This street is already considered very wide, cars and motorcycles can pass by together. Our friend told us that some of these people are gangsters, trying to protect their territories. 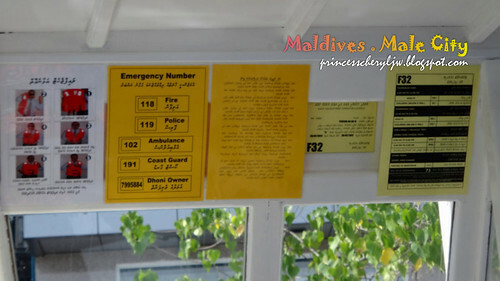 You see, mafia appears everywhere, even in such a small city like Malé. But no worries, you will be safe to walk in the city. I was attracted by this wall. It's not only some general graffiti. 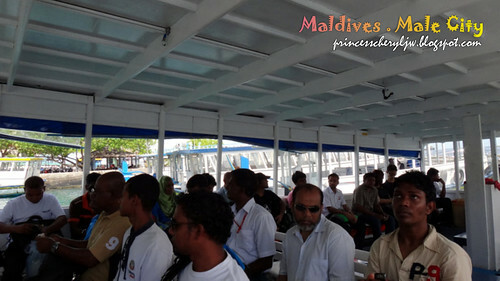 It contains the patriotic spirit and Maldivian's affection towards soccer. A mere 300 thousand of citizens with the ability to gain a place in the international games, it's not simple at all. Most of the streets are one-way, and super narrow, very easy to cross the road. 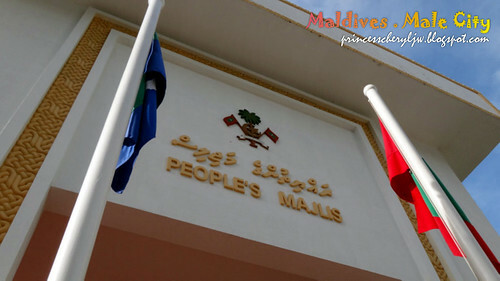 The People's Majlis or The Majlis of the Maldives is the main legislature body of the Maldives. 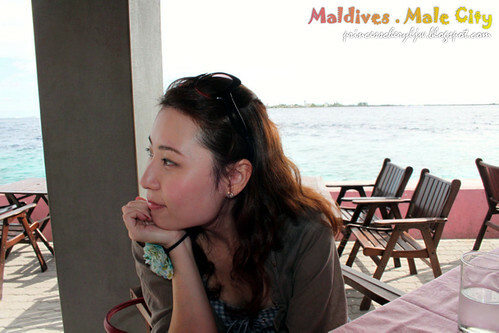 Holiday Inn Hotel Malé. 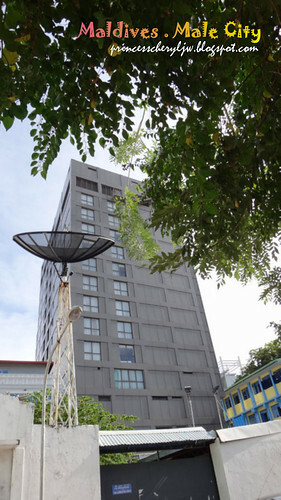 Previously it was the tallest building in Maldives, but now Velanage had replaced it as the tallest and the biggest building in the Maldives. 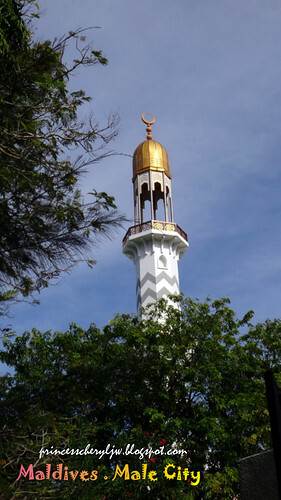 Munnaaru, the gleaming white minaret built by Sultan Ibrahim Iskandhar in 1675. 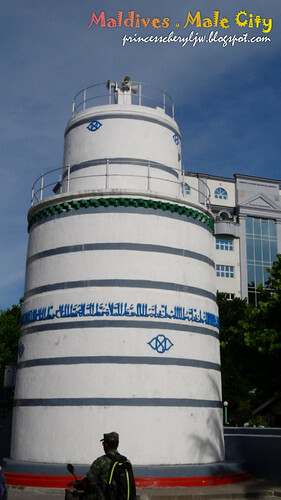 The chief muezzin of Malé called the faithful to prayer from this minaret before the Islamic Centre was built. 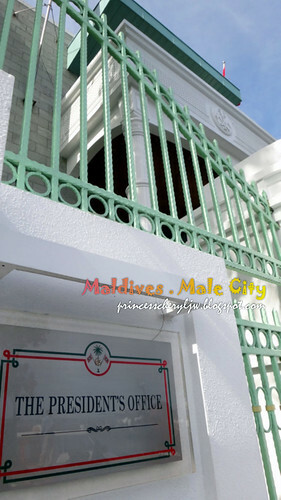 Mulee-aage, the former Presidential Palace, was originally built by Sultan Shamsuddeen III for his son just before the First World War. After the sultan and his son were banished in May 1936, the house was declared a government property. 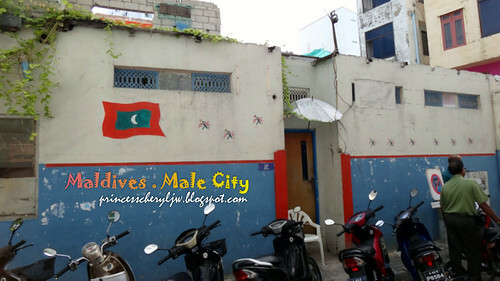 The Mulee-aage was officially declared and used as an office complex by subsequent governments. 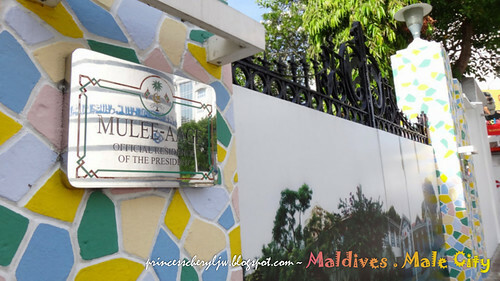 After the country became a Republic in 1953, the Mulee-aage became the 'President's Official Residence'. In 1986, the house was renamed the 'Presidential Palace' and was upgraded to hold official functions and to accommodate visiting Heads of States and other foreign dignitaries. 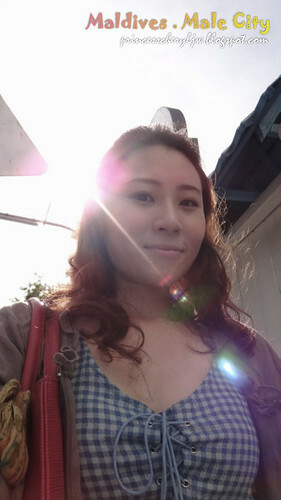 A sunny morning. 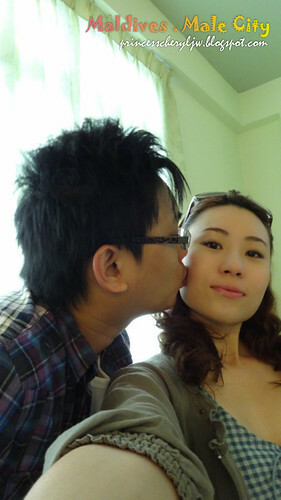 Good start for our honeymoon trip. Sultan Park & The National Museum. 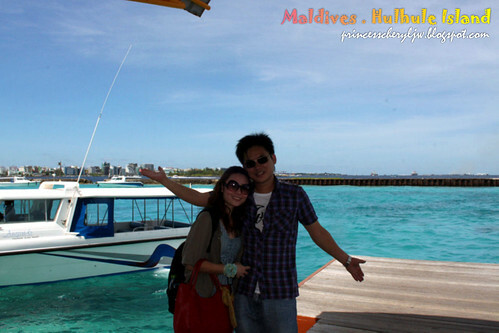 Maldives changed from a Republic to a Sultanate and back to a Republic in a span of just 16 years (1953 to 1968). The Sultan's Palace however was demolished except for a three-storey building and the palace grounds were turned into a public park, known as the Sultan Park. The surviving palace building within the park is today the National Museum. Opened on November 19, 1952, the museum displays a large and varied collection of a glorious bygone era including stone objects from the pre-Islamic period; royal antiquities like thrones, palanquins, royal sunshades, costumes and shoes, coins, and ornaments, arms and armour. 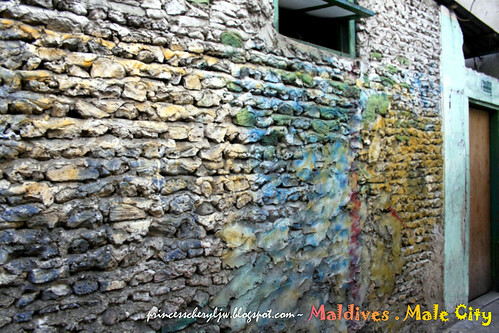 Coral stone sculptures, lacquered wooden containers, miniature hand-written Quran, hookahs, sunshades, traditional log, drums from the Royal Palace used in the popular music of Bodu Beru, and the very interiors of the museum - retained from the days of the Sultanate - are the added attractions. Two of the most significant items on display are the coral stone head of Lord Buddha, a 11th century piece from Alifu Thoddu and a 13th century engraved wooden panel from Hukuru Miskily. Timings: 9AM - 3PM. Closed on Fridays and public holidays. The Islamic Centre. 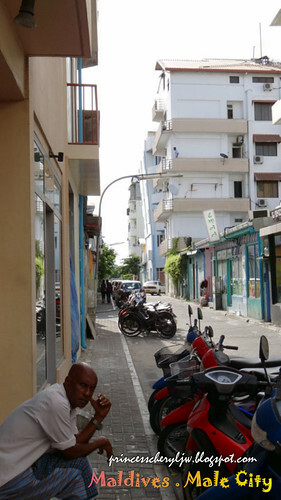 It is the most famous architectural landmark of Malé. This three-storey Islamic Centre was opened in November 1984. 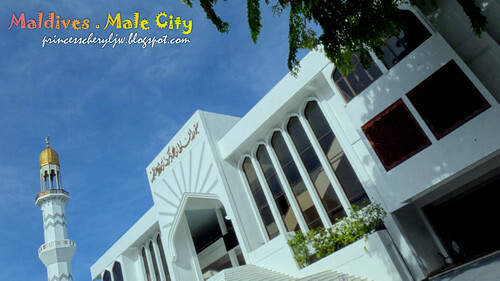 The Center's Grand Friday Mosque, Masjid-al-Sultan Muhammad Thakurufaanu-al-A'z'am, is the biggest in the Maldives, accommodating more than 5,000 worshippers. The shining golden dome of the mosque is a standout as are also the interior walls decorated with beautiful woodcarvings and Arabic calligraphy. The Center also houses a library and a conference hall. A few turns then we're at The President's Office. The entire city/island is 1.5km wide and 1 km north to south. We've walked half of it in just an hour! 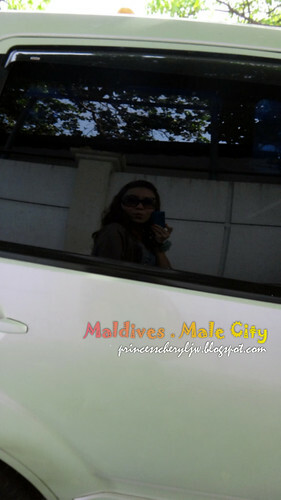 Malé is really small! A few turns and we're back again to the seaside. 9.15am breakfast time. 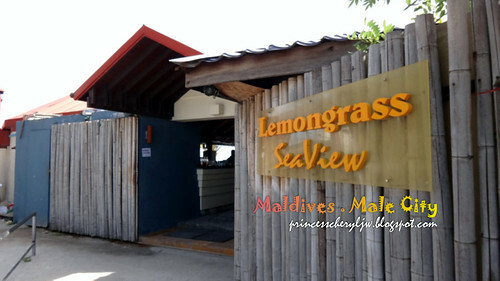 Our friend brought us to Lemongrass Sea View. It's really sea view. Sea wall made of tetrapods. 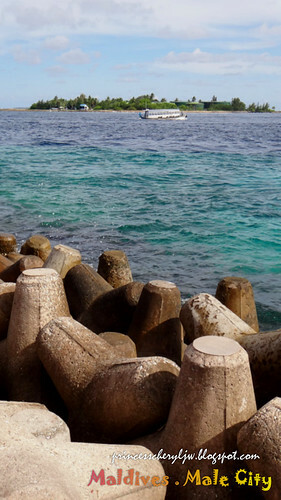 The tetrapods were donated by the Japanese Government and used to help protect the low-lying city from big seas and tidal surges during bad weather. You can see fishermen sitting atop doing fishing in the late afternoon. Every restaurant you go for a meal, there will be a bottle of cold drinking water provided. Always the best choice for a hot weather. 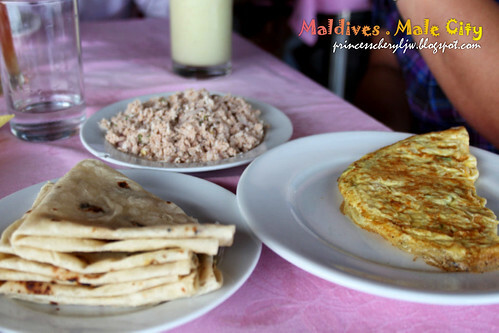 My favorite local dish throughout the trip -- Maldivian Coconut Sambol. 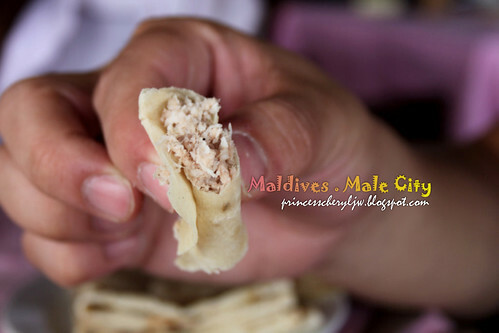 It is made of ground coconut mixed with chillies, dried Maldive fish and lime juice. This is ground to a paste and eaten with rice or chapatti, as it gives zest to the meal and is believed to increase appetite. Time to move on. 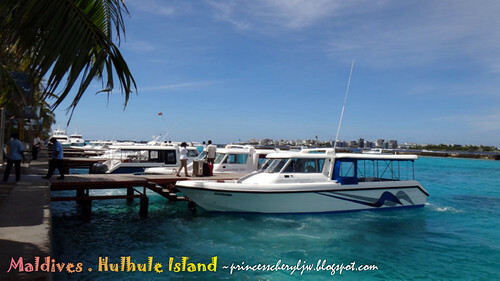 Back to Hulhule Island (airport) to board a sea plane to our resort at Meemu Atoll. 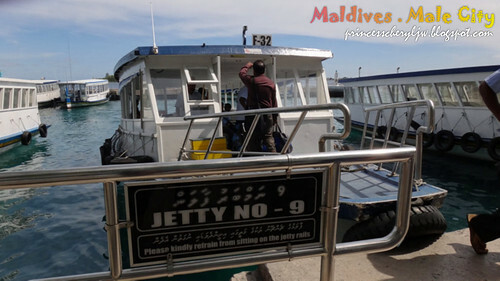 This jetty reminded me so much of Halong Bay. The jetty so look-alike. 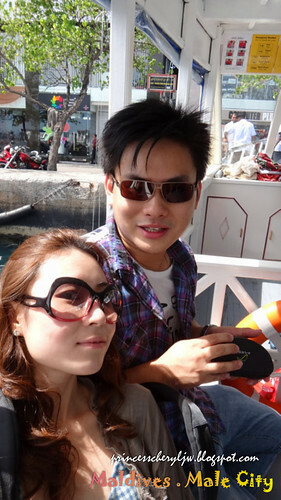 (Click here for my Halong Bay travelog post). 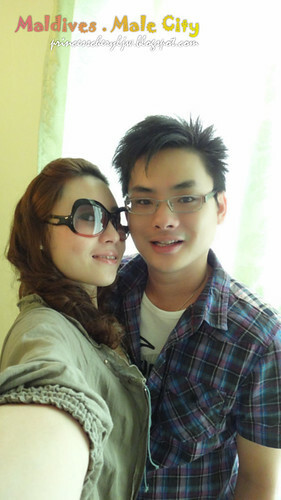 Now they share another similarity -- both being the final 28 of New7Wonders of Nature. All black except us... 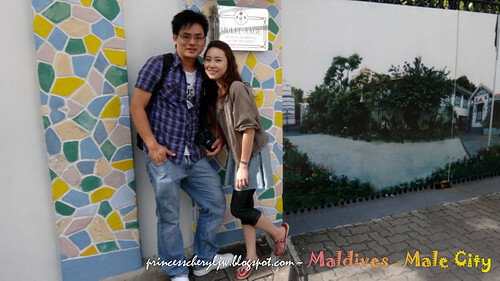 The locals actually look like our fellow Malysian Indian Muslims. The amazing blue which is indescribable! 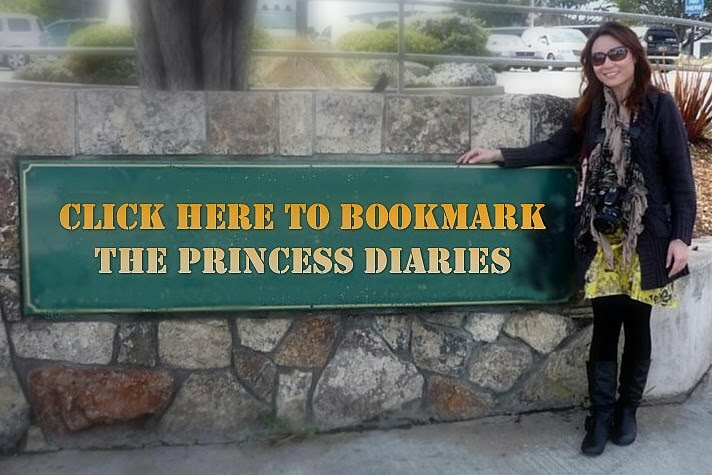 The photos are non-edited! Oh my gosh I LOVE BLUEEEEEEEE~ Is the water fake? I'm going crazy with the blue!! Wake up... This is only the airport, we've yet to see it from the sea plane! 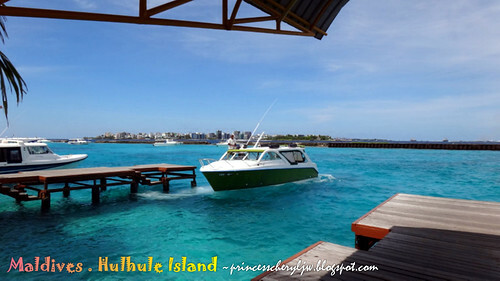 Hulhule Island is the home to Maldives' Ibrahim Nasir International Airport, and the sea-plane terminals operated by both Maldivian Air Taxi and Trans Maldivian Airways. 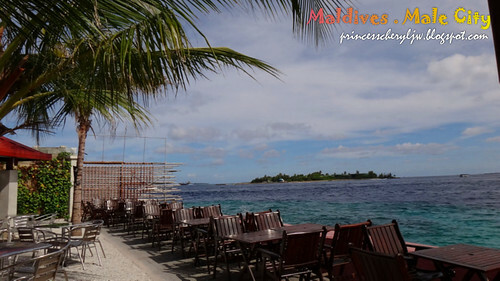 The island also serves as a hub for travellers wishing to connect to a domestic flight to the further outlaying atolls. 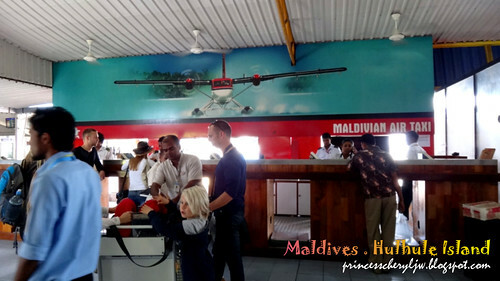 We will be flying with Maldivian Air Taxi's De Havilland Twin Otter aircraft.